Here are even more Christmas pages to print and colour. We have printable crafts, flash cards that can double as mini colouring pages and much more! Print out this pretty Christmas bells colouring page for some Christmas colouring fun! A simple Christmas bells colouring page with the words underneath. These pretty bells are ringing out to announce the arrival of Christmas - and just waiting to be coloured in! 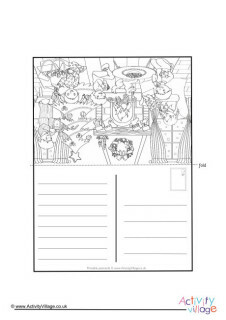 Here's a grand Christmas cake colouring page for the kids to decorate with their crayons! You could also use it as a wedding cake or a special birthday cake, too. Here's a sweet colouring page for younger children. Colour in a penguin Christmas card for a festive colouring activity! Dad is in charge of putting the star on top of the Christmas tree in this fun Christmas colouring page. We've designed it so that the tree (and the father) can be cut out and put out on display, together with our other Christmas characters, if you like. A little toddler plays outside in the snow while a cute squirrel squirrels away a precious acorn for the winter and a robin finds a twig of holly. Print, colour, cut out and display these three friends from our Christmas characters set. These adorable Grandparents could be relaxing after Christmas dinner! They would be great as part of an alternative Christmas display. These children are enjoying playing outside on a snowy day, and it looks like someone is making a snowman! Colour them in, cut them out and stand them up for your Christmas or winter display. Kids love Christmas and these two children look like they might be hanging up their stockings. Hurry up Santa! This mother and baby might be going Christmas shopping! Or perhaps for a nice snowy walk in the park? This cute cat and dog are getting into the Christmas spirit! They would make great decorations for the tree or mantlepiece. This cute and very well dressed snowman is a great Christmas activity. Colour him in and then stand or hang him up! The instructions are printed on the sheet for you. There's lots of lovely detail to colour in on this pretty colouring page of a church at Christmas. Print this original Christmas classroom colouring page, with lots of detail to keep kids interested! Colour in these three little pictures – of a Christmas tree decoration, a sweet gingerbread house and a funny little Santa – and then cut them out for sticking or hanging! How warm and cosy it must be inside this Christmas cottage! There's a fire burning, and a Christmas tree that you can just glimpse through the window, and a welcoming wreath on the door. It makes a lovely colouring page for younger children. Here's a fun - and slightly different - activity for Christmas. First practise cutting skills by carefully cutting out the small rectangles. Then work out where they should fit into the larger picture and stick them in. And now colour the whole picture in! Christmas wouldn't be Christmas without a sprig of mistletoe hanging in the doorway! Here's a simple outline colouring page for kids to colour. Is your Christmas tree looking bare this year? Would you like to get the children more involved, and create something that they can bring out proudly year after year to put on display? Here is a black and white set of our Christmas picture cards. Colour them in to make some pretty gift tags, or use them in conjunction with our Christmas word cards for a matching activity. Here's a pretty Christmas room to print and colour, complete with Christmas tree and stockings and presents! Ask the kids to grab some pens and add some colour to this lovely Christmas scene colouring page. Here's a really special Christmas holiday colouring project to enjoy with the children! We have a whole Christmas Village full of beautiful, old-fashioned buildings, drawn with beautiful detail and precision. There's lots of detail on this Christmas village colouring page to keep the kids busy while they're waiting for Christmas to arrive! Colour in these Christmas decorations and use them with our Decorate the house for Christmas activity to get the house ready for the holidays! The kids will enjoy colouring in this detailed nativity scene at Christmas, which includes three beautiful angels above the stable. Here's the simpler version of our nativity colouring page, perfect for younger children. Older kids might like to try our more detailed version here. This detailed colouring page of the shepherds looking down to Bethlehem is perfect if you're learning about the Nativity story. Colour in this pretty snowglobe, complete with snowy cottage, Christmas tree and cheerful snowman!